Tired and faded skin is revitalized by this creamy natural body wash for aging skin. Our Pomegranate Body Wash is an invigorating bath and shower lather that is free from synthetic detergents, and that gently cleanses your skin without stripping it of moisture. The antioxidant-rich pomegranate seed oil in this decadent body wash for aging skin helps to renew your skin, and macadamia seed oil leaves your skin moisturized and smooth. Infused with the pure essential oils of vanilla, blood orange and neroli, our creamy Pomegranate Body Wash will stimulate your senses and bring balance to your body and soul. Step out of your shower with skin that’s clean, renewed and soft to the touch. Nothing can make you look and feel younger than a daily regimen using Pomegranate Body Wash and other pomegranate products to nurture your timeless beauty. Weleda Pomegranate Body Wash helps retain moisture and inspires the senses. Tired and faded skin is revitalized by this creamy natural body wash. Weleda Pomegranate Body Wash is an invigorating bath and shower lather that is free from synthetic detergents, and that gently cleanses your skin without stripping it of moisture. The antioxidant-rich pomegranate seed oil in this decadent body wash helps to renew your skin, and macadamia seed oil leaves your skin moisturized and smooth. Infused with the pure essential oils of vanilla, blood orange and neroli, Weleda creamy Pomegranate Body Wash will stimulate your senses and bring balance to your body and soul. Step out of your shower with skin that’s clean, renewed and soft to the touch. Nothing can make you look and feel younger than a daily regimen using Weleda Pomegranate Body Wash and other pomegranate products to nurture your timeless beauty. 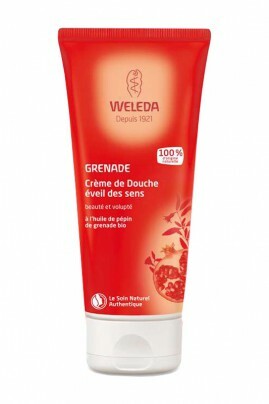 Apply Weleda Pomegranate Creamy Body Wash to your body with a loofah or hands and rinse thoroughly.